Note: This article was originally published in the July 2008 issue of the Denver publication Community News. A newcomer to the wide world of herbal teas might find a perusal of the large selection in any health food store - or even the smaller selection in the average supermarket - a rather bewildering experience. All the boxes are so beautiful! And they all promise such wondrous health benefits! But the variety is dizzying. What to buy, what to try? And how to know whether there are any hidden dangers lurking in those colorful little boxes? I'll give you a few suggestions here, listing both the benefits and possible dangers of some of the most popular types of herbal tea. Herbal "teas" are actually herbal infusions or tisanes. Tisane is derived from a Greek word meaning a drink made from pearl barley. An herbal "tea" is not true tea, but rather an herbal infusion made from anything other than the leaves of the tea bush (Camellia sinensis). It can be made by pouring boiling water over fresh or dried flowers, leaves, seeds, or roots, then letting the mixture steep for a few minutes, then draining off the hot liquid. But in this modern day and age, with so many delectable varieties packaged in handy, sanitary teabags and sold for relatively little money, most city-dwellers prefer to buy their herbal teas in stores or online. There are herbal teas that are mixtures of as many as a dozen or more different ingredients. Some I have in my kitchen right now are Celestial Seasonings' "Tension Tamer" (with 13 ingredients, including peppermint, chamomile, licorice root, and vitamins B6 and B12); the same company's "Mandarin Orange Spice" (with 11 ingredients, including orange peel, hibiscus, rose hips, and coriander); and TAZO's "Wild Sweet Orange" (with 13 ingredients, including lemongrass, blackberry leaves, rose hips, spearmint, rose petals, and orange essence). In my opinion, these are all delicious mixtures, but you might be happier - and possibly safer - if you first try herbal mixtures that consist of fewer ingredients. Adverse reactions to some of the components of mixtures are certainly not unknown. Especially if you are pregnant, nursing, taking prescription medications, or have known allergies to certain foods or plants, caution and consultation with a physician or pharmacist are advised. Obviously, it's much easier to research the possible side effects of a single ingredient, such as the chamomile in Traditional Medicinals' "Organic Chamomile," or the four ingredients in the same company's delicious "Ginger Aid" mixture, than it is to seek out the effects of a dozen or more ingredients. Traditional Medicinals is a company that practices responsible marketing. I buy their teas at the local Vitamin Cottage. A side panel of the box clearly states that you should not use chamomile tea if you have known allergies to plants of the Asteraceae (daisy) family, such as blessed thistle, echinacea, safflower, or yarrow. That's because chamomile is closely related to ragweed. It can cause violent reactions in hay fever sufferers, up to and including anaphylactic shock and death! However, for most people, very popular chamomile tea is soothing to both the digestion and the nerves. It is a natural sedative, and can help relieve anxiety and insomnia. It also has anti-inflammatory and anti-spasmodic properties. It can help relieve cramps. An exfoliating paste for sensitive skin can be made by mixing the tea with powdered milk. Use cooled chamomile tea bags to make a compress to treat skin irritations and even burns. Reduce puffiness and eye strain by relaxing with cooled teabags over your eyelids. Ginger tea can help relieve feelings of nausea. Thus it's popular with pregnant women who are suffering from morning sickness and also with travelers who are prone to motion sickness. I like Traditional Medicinals' "Ginger Aid," which also contains blackberry leaf, stevia leaf, and lemon myrtle leaf. The spiciness of the ginger can be softened a bit by adding a small amount of honey to your cup. Peppermint is another extremely popular herbal tea. Some sources claim that it can relieve stress even better than chamomile. It soothes the stomach after meals, and also freshens the breath. My Denver acupuncturist, Lauren Mathews, recommends it for its cooling properties. A peppermint tea blend that I like is TAZO's "Refresh." Besides peppermint, it contains spearmint and tarragon. Sometimes I prepare an extra-large mug of hot water and put into it one bag of "Refresh" and one bag of TAZO's "Zen" tea. The latter is a delicious green tea which is flavored with lemon verbena, spearmint, and lemongrass. (Lemongrass also has a calming effect.) "Zen" is the most popular tea that I serve to my many language students. 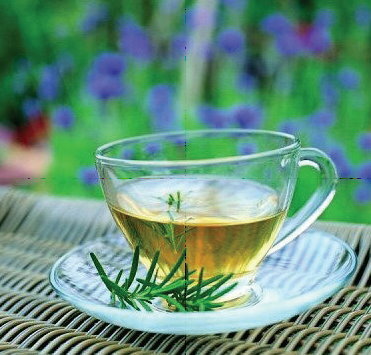 I ran across one mention of rosemary tea as a remedy for headaches. If you are prone to headaches, it's worth a try. Again, a bit of honey can relieve any bitterness. If you have a sore throat or a cough, give one of the popular throat-soothing mixtures a try. Traditional Medicinals' "Throat Coat" is marvelous! Some of its ingredients are licorice root, slippery elm bark, marshmallow root, and sweet orange peel. Obviously, this short article barely scratches the surface of the very broad topic of herbal teas. I hope you'll do some online research of your own, and then embark on a delicious voyage of discovery.